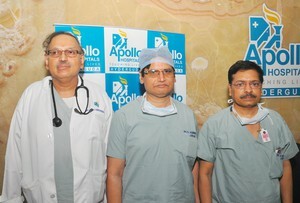 Cardiologists at Apollo Hospitals, Hyderaguda (Hyderabad), have performed a pioneering procedure on a middle aged male patient suffering from a ‘Chronic Total Occlusion’ (CTO), using a cross boss and stingray device , for the first time in the country. Chronic Total Occlusion (CTO) is a hardened 100 per cent block in coronary artery,formed over a duration of months or years. CTO causes cardiac pain on exertion. Usually bypass surgery is needed to clear the block, cardiologist HOD, V. Surya Prakasa Rao, and Cathlab Services Director Dr. P.L.N. Kapardhi, said in a joint press conference here today. The patient has been complaining of chest discomfort on walking for the last few months and after an ECG on him , established he suffering from a heart attack, the cardiologist said. A coronary Angiogram on him indicated 100 per cent blockage of a major blood vessel supplying blood from heart, with hard fibrotic calcific plaque. Looking at the complexity of the blockage, the patient would have in the normal course been advised a Bypass Surgery, he said. He (Patient) consulted Apollo Hospitals for an opinion. We found him an appropriate case for CTO-PCI Technique, offered to clear the block and put a Drug Eluting Stent without Surgery, Dr Rao said. Using the CROSS BOSS and stingray device the CTO was successfully cleared under local anesthesia the cardiologist said, adding, the CROSS BOSS and stingray device invented by American Cardiologists is designed to penetrate and drill hard or calcified occlusions. This technique creates channel in hard block in a expeditious manner and enables deploying of balloon, drug eluting stent in the distal true lumen with precision. The entire procedure takes one-and-a- half to two hours and patient can be discharged after 48 hours. The procedure doesn’t involve any suturing, the expert added.